“More lies from Amnesty International!” screamed a headline in a Kenyan newspaper, back in the 1990s. When assailed for their human rights records, the unimaginative response of many governments has been to attack the messenger. If Amnesty International criticizes a repressive regime, the regime tends to shout back that Amnesty is being unfair, dishonest, and even imperialist. That’s a pattern now being followed by a regime that doesn’t like to think of itself as repressive: the government of Canada. Ottawa failed in its bid to win a UN Security Council seat in 2010, mostly through its own poor planning and clumsy lurches away from rights-promoting policies. Ever since then, the Harper government has taken a perverse pleasure in attacking the United Nations as a dictators’ club at worst, a gang of dictator-coddlers at best. 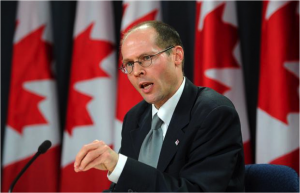 So it was odd to see the vitriol hurled at the UN Special Rapporteur on the Right to Food, Olivier de Schutter, when he visited Canada last year as part of his normal duties. On March 4, de Schutter released his report on Canada as part of this year’s UN Human Rights Council preparations. The Canadian government response, once again, was to attack the messenger and deny that Canada had anything to learn on human rights. In other words, the response was much the same as the response normally given by repressive regimes, from Syria to Cuba. In a webcast to 50 locations across the country hosted by Food Secure Canada, de Schutter pointed out that there were three million Canadians living in poverty, with one million food-insecure (meaning they could not be sure they would have enough to eat). “In that respect,” he said, “Canada is failing at least part of its population.” The problems were particularly severe among indigenous people. The government response rejected his recommendations and, more seriously, attacked him for allegedly exceeding his mandate. Part of the issue was whether the division of powers between Ottawa and the provinces helped or hindered the promotion of human rights such as the right to food. Some writers decry the Harper government’s verbal assault on the UN and retreat into smug preaching as a departure from an alleged Canadian tradition of promoting human rights internationally. A virtual national myth, in fact, has been built on claims that Canada is a human rights promoter. The Canadian government has no qualms about making this claim. And yet that Canadian diplomatic self-image is essentially a myth. It makes Canadians feel virtuous, but it has little basis in fact. Yes, McGill law professor John Humphrey produced one of the first drafts of the 1948 Universal Declaration of Human Rights. But as archivally-driven studies have revealed, the Canadian government opposed the declaration, abstained when it first came to a vote (in company with Saudi Arabia, the Soviet bloc and South Africa) and only voted in favour in the end under American pressure. (That’s right: the United States wanted strong UN human rights oversight; Canada resisted it.) Part of the resistance lay in Prime Minister Louis St. Laurent’s concerns that the UDHR touched provincial jurisdiction, an issue that remains live today. It was not until the 1970s, after consultations with the provinces, that Canada got on board with UN human rights instruments. There’s a cottage industry of accounts of Canadian promotion of international human rights. Part of it is academic, with claims for instance that Canada under Prime Minister Pierre Trudeau tried to promote human rights overseas. The facts don’t support that: Trudeau tended to opt for friendship with regimes promoting economic development, at the expense of rights promotion. His sympathy for India’s Indira Gandhi, Singapore’s Lee Kuan Yew, and Indonesia’s General Suharto, are examples. Indeed, one of his foreign ministers noted that he simply didn’t care much about human rights outside Canada’s borders. It is Conservative Prime Minister Brian Mulroney, ironically, who declared rights stood at the centre of Canadian foreign policy – though actions fell far short of rhetoric. The diplomatic self-image of Canada as global voice for human rights, in other words, is an invented tradition: “a set of practices … which seek to inculcate certain values and norms of behaviour by repetition, which automatically implies continuity with the past,” in the words of the great British historian Eric Hobsbawm. The repeated declarations that Canada stands for international human rights have been more influential than actual Canadian government actions in forming a diplomatic self-image among Canadians. We seem to believe instinctively that Canada stands up for human rights. This diplomatic self-image can be destructive when it underpins self-righteous rejections of outside comment on our domestic rights record, like that of Mr de Schutter. Here, the self-image prompts some Canadians to refuse to listen, as if human rights can only travel in one direction, from a rights-respecting West to a rights-resistant global South. I want to suggest, however, that the diplomatic self-image can also be an asset. If Canadians believe our country promotes human rights globally – even though such claims are hard to sustain once you start detailed historical study of a human rights example – then some Canadians work to point out the “rhetoric gap” and press the Canadian government to match actions and words. The way Food Secure Canada framed its webcast and its ongoing campaign, with links to the UN’s Universal Periodic Review of Canada’s human rights record slated for April, is an example. The diplomatic self-image of Canada as rights promoter is an invented tradition. But if it’s being used to press for better Canadian action on human rights, then long live invented traditions. David Webster is assistant professor of History at Bishop’s University (Sherbrooke, Quebec).